In the wake of Delta Air Lines’ drastic change to its SkyMiles program, switching to a fare-based system instead of miles earned, JetBlue just raised the ante in what is sure to be a Frequent Flier Program war. 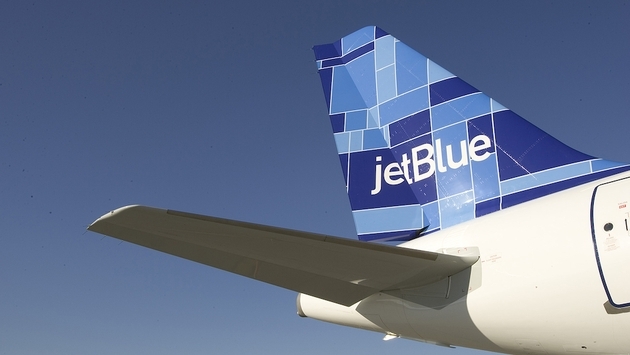 The New York-based carrier has, quite literally, issued a challenge to other airlines this morning with the announcement that it is offering new passengers elite status in its TrueBlue Mosaic frequent flier program. Members with equal status on other airline loyalty programs can qualify for the same on JetBlue, or fliers can take the ‘TrueBlue Mosaic Challenge’ and earn 3,750 base points over the next 90 days to qualify. “As other carriers devalue their loyalty programs for most of their fliers, TrueBlue is actually strengthening its value for members. In fact, we recently introduced features such as points that don't expire and Family Pooling," said Kelly Roe, JetBlue's director of loyalty and partnerships. "This is a great opportunity for travelers enrolled in other airline loyalty programs to see what makes TrueBlue and Mosaic unique. Our existing TrueBlue members now have a faster path to earn Mosaic and receive even more benefits." JetBlue gives three points for every dollar spent, so frequent fliers would have to accumulate $1,250 worth of tickets in 90 days to be eligible. Anyone with the specified status in one of the qualifying airline loyalty programs will be eligible for automatic Mosaic status match through 2014 when they sign up for the Mosaic Challenge. All that is required is proof of current status. Anyone is eligible to sign up for the Challenge, regardless of their status on other carriers. Customers who complete the challenge, in which participants have 90 days to earn 3,750 flight points, will receive Mosaic status for the rest of 2014 through Dec. 31, 2015.